The 2017 season began promisingly enough – 11 wins in their first 20 games was the team’s best start since 2011. Amid the growing optimism, I still believed the Phillies would end up with a win total in the 70’s, but it looked like they could finish closer to 80 wins than 70. The team was young but developing, and pieces of the future core were settling in. Herrera. Franco. Nola. Velasquez. Eickhoff. The team was going to lose games, but the first steps towards respectability had been taken. Or so we thought. The free fall that followed the favorable foundation of the Phillies season was foreseen. (Wait – no. Unforeseen. Sorry. I just got on an f’ing roll.) In the next 48 games, the Phillies only managed to equal the 11 wins they compiled in the first 20. Since 1997, that 11-37 stretch has only been matched in two seasons – 1997 and 2015. The 1997 Phillies finished the season 68-94, good for last place in baseball. The 2015 Phillies were even worse, narrowly avoiding 100 losses (63-99) while cruising to a last-in-baseball finish. The Phillies, as they are constructed now, are projected to close 2017 with a record of 63-99… and that might be optimistic, given that two of their three best hitters (Kendrick and Nava) are on 1-year deals and likely to be dealt at the trade deadline. To even reach 70 wins, they will need to win 48 of the remaining 94 games (an above .500 rate, which I think even the most faithful of fans would deem doubtful). It’s possible, if not likely, that the 2017 Phillies will follow the lead of the 1997 and 2015 Phillies and sink to the bottom of the pack. The silver lining to all of this – with the worst record in baseball comes the most valuable draft pick: 1-1. The 1998 1st overall pick was Pat Burrell (who went on to have a solid career) and the 2016 1st overall pick was Mickey Moniak (currently 19 years old and holding his own at Single-A). 2017 is rough. 2018 might not be much better. But the Phillies are compiling talent. They won’t be bad forever. Game 62: Loss, 5-6. The first game of a home-and-home series between the Phillies and the Red Sox turned out to be an exciting one. The Phillies brought 8 man to bat in the top of the 1st and plated 4 of them. That 4-run cushion was gradually chipped away as the Red Sox scored 4 unanswered runs of their own (which could easily have been 5, if it hadn’t been for a good throw to home by Odubel Herrera to finish off the 8-3 double play). Aaron Altherr and Howie Kendrick’s combined efforts gave the Phillies the lead back in the 5th, only for the-bullpen’s-only-real-trade-candidate Pat Neshek to blow the lead in the 8th inning. Without any quality options, Pete Mackanin turned to Casey Fien to go as long as he could. He got into some trouble, but was able to turn in a scoreless 9th and 10th innings. That should have been it for him – Fien has pitched more than 2 innings in his career only 5 times, and 3 of those appearances were in 2009. Mackanin must not have gotten the memo – Fien went back out for the 11th and retired one of the next four batters en route to a walk-off loss. Game 63: Loss, 3-4. Aaron Altherr hit his 10th homer of the year, Ben Lively went his usual 7 innings pitched (*yawn*), and Maikel Franco registered 4 hits on the night, but the offense wasn’t able to muster enough in yet another extra inning walk-off loss to the Red Sox. Game 64: Loss, 3-7. One night after hitting his 10th round tripper of the year, Altherr came back for an encore and sent his 11th into orbit. With all of the struggles elsewhere on the team, it’s nice to focus on one of the positive things that has emerged this season. So we’ll leave this recap at that. Game 65: Win, 1-0. Chris Sale and the Red Sox went up against Nick Pivetta and the Phillies. One of the teams was shut out. Somehow, it wasn’t the Phillies. Pivetta had by far the best game of his young career, setting career highs in innings pitched (7.0), strikeouts (9), and a career low in earned runs (0). The game lasted a mere 2 hours and 25 minutes (Pivetta and Sale are both among the faster pitchers in baseball), so fans didn’t get much of an opportunity to relish this one. Game 66: Loss, 4-5. Aaron Nola was far from good, allowing 5 runs on 9 hits in 6 innings. The offense wasn’t doing much to pick him up – despite only 5 hits and 2 walks, they somehow scratched out 4 runs. Just another forgetful loss in what has turned into a long season. Game 67: Loss, 1-5. My favorite sabermetric site, Fangraphs, makes it very straightforward to see who is to blame for a loss (or to praise for a win) with WPA. Was it the offense or the defense that came up short? In this game, the answer is “both”. Jerad Eickhoff did well, limiting the Dbacks to 1 run over 6 innings. Then came the 7th. Joely Rodriguez and Casey Fien made a mess of the 7th inning as the Dbacks piled up 4 runs in the inning. 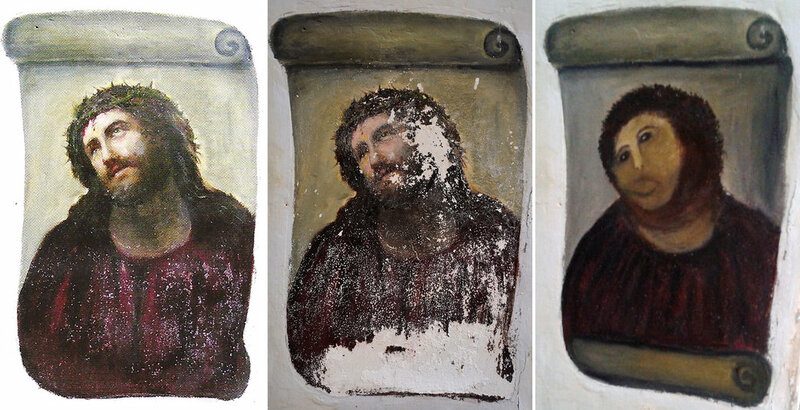 Much like a certain fresco, it was almost beautiful in just how disastrous it was. Game 68: Loss, 4-5. All they needed to do was hold a 1 run lead for a single inning. That was it. 3 outs and they would have sealed victory. Hector Neris went into the 9th and, ignoring the first three batters, retired all that he faced…but including those three pesky batters, he walked one and allowed two singles to tie up the game. The offense was held scoreless after the 6th as the Diamondbacks won in the 10th and swept the Phillies. But hey – Altherr hit another home run. That’s something, right? It has been a bleak stretch of Phillies baseball. Due to the way I recap games (Monday-Sunday), I haven’t written about more than 2 wins since April 24. If there’s any solace to be found beyond “good draft pick”, it’s that 17 of the Phillies losses are 1-run losses (the most in baseball). As a percentage of their total losses, that comes to 37% (2nd in baseball, behind the Yankees 41%). At least they’re keeping things interesting, even if they’re off to their worst start since 1997.